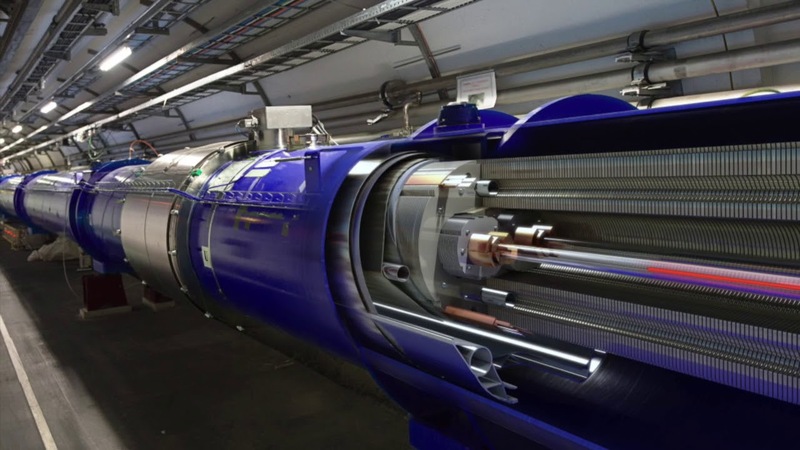 Home » Have you ever listened to a superconducting magnet sing? Superconducting magnets became part of the entertainment programme at CERN organized for the EUCAS 2017 conference last week. Magnets that have made the history of superconductivity, from Tevatron’s very first dipole to the very latest additions to the family (FRESCA 2 and the High Temperature Superconductor) were on display in the huge magnet-testing facility and turned into musical instruments for the night. Sonification experts and scientists Domenico Vicinanza (Anglia Ruskin University, Cambridge) and Genevieve Williams (University of Exeter) placed mechanic transducers on superconducting magnets and cavities, making them vibrate at audible frequencies. The geometry, size and material of the magnets and cavities shaped these vibrations into unique sounds melodies that provided the ambient music for the evening. Domenico also orchestrated a “Field Polyphony” by mapping graphs of superconducting magnet trainings to a music scale. The same sequence of notes was then used as the score for the closing concert of the event, played live with a cello, flute and clarinet. How does the sonification work? The starting point is the graph above which shows magnet training. “Training” means that the current is gradually increased in the coils until the magnet quenches (suddenly returning to a non-superconducting state). This operation is repeated several times and produces this graph which was obtained with a quadrupole for the High-Luminosity LHC project. The value of the quench current is mapped to a musical scale as seen in this image. The sequence of notes follows the same profile of the original graph. The melody is finally orchestrated, for example by arranging it for violin, clarinet and cello as seen on this music score.